Hold down the Power button for approximately five seconds. 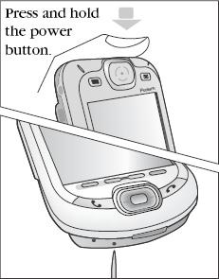 As soon as the mobile computer starts to perform a warm boot release the Power button. 1. Press the primary battery release on the mobile computer to partially eject the battery from the mobile computer. 2. While the battery is partially released, simultaneously press and release the handle trigger and the Power button. 3. Push the battery to fully re-insert it in the mobile computer. One audible click can be heard as the battery is fully inserted. 4. The mobile computer initializes. 2. On an MC9090-G, while the battery is partially released, simultaneously press and release the trigger and the Power button. 3. On an MC-909X-K or MC909X-S, while the battery is partially released, simultaneously press and release the left scan button and the Power button. 4. Push the battery to fully re-insert it in the mobile computer. One audible click can be heard as the battery is fully inserted. 5. The mobile computer initializes. in the back of the mobile computer. - Release the Power button and right Scan/Action button. Halten Sie den Power button für ca. 5 sec. Sobald der EDA neu startet Power button loslassen.